Tumblr is a unique blogging site that specializes in striking visual design. Besides providing great blog layouts that can help your personal or small-business Website look more impressive, Tumblr has posting tools that make it easy to share photos and videos quickly. However, the service has some idiosyncrasies that take some getting used to. With that in mind, let's look at what it takes to start your own Tumblr blog and take the first steps toward making it popular. Starting a Tumblr blog may be the easiest thing you do on the site. Just click Sign up in the upper right corner of the Tumblr.com homepage. Then enter your email address, a password, and the website URL you'd like to reserve. Most of the obvious names and jokes are taken, so it pays to be creative when thinking of a short, clever URL that will be easy for your readers to remember. Tumblr will send you an email to confirm your new account; when you receive it, you can head over to your Twitter dashboard, the nerve center of your new blog. 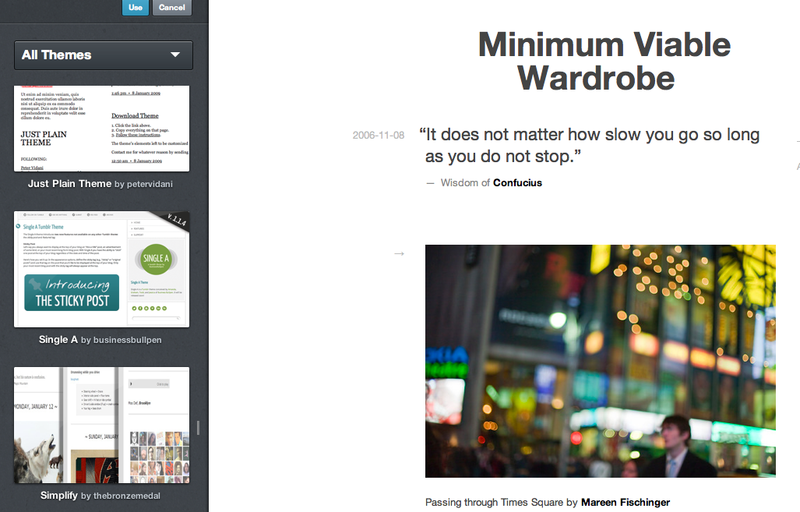 The Tumblr dashboard is the nerve center of your blog, and you can find it on the top-right of the screen. As you begin creating your profile, don't worry about being tied down to your custom URL--Tumblr allows you to start more than one blog on its service. To start a new Tumblr blog, click the icon that looks like three bars next to your blog's name on your dashboard and then select create new blog. Once you've created a new blog, you'll going to want to make sure that it looks great. To get started customizing your Tumblr blog, choose Customize Theme on the right hand side of your dashboard. That link will take you to a selection screen that displays various premade Tumblr themes on the left, and a mock-up of how a selected theme would look like on your site on the rest of the screen. 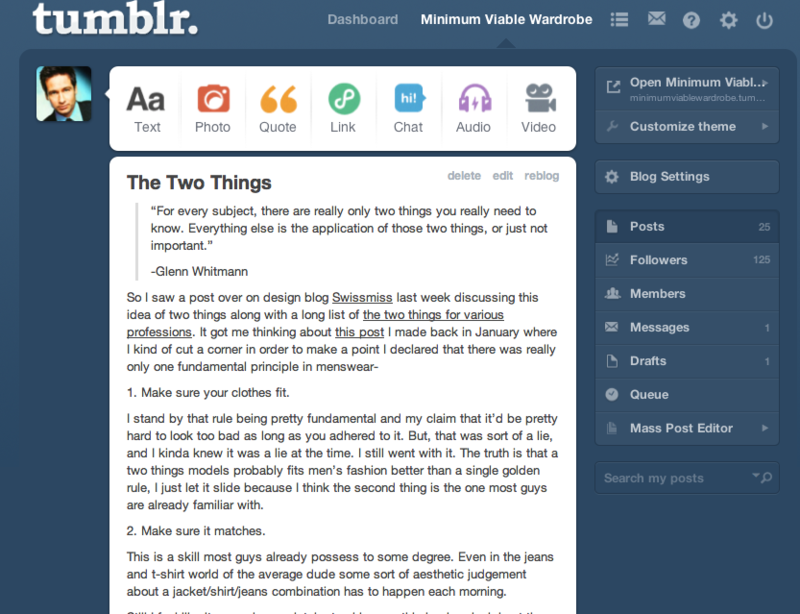 Tumblr automatically shows you a preview of how your blog will look with a new theme. Most of Tumblr's themes are free, but some paid themes are available as well (at amounts ranging from $9 to $49) to help your blog stand out from the crowd a bit more. You can also customize the color palette of your chosen theme, and tweak characteristics such as the color of links, backgrounds, and text. Tumblr's premade themes are excellent; but if you aren't a fan, you can't directly edit the code as you can with WordPress and other blogging platforms. This limitation can be frustrating for experienced programmers, but most users consider it a small price to pay for the convenience of Tumblr's design. Once you've perfected the look of your blog, you need to start cranking out high-quality content to make it worth visiting. Near the top of your dashboard, you'll see a bar with options such as 'text', 'photo', and 'quote'. These are the different blog templates that Tumblr provides for different kinds of content. These templates make it a snap to share almost any type of content you can imagine on Tumblr. For example, if you want to add a YouTube video, click video and give Tumblr the URL for the video you want to share. Tumblr will automatically generate code that you can use to attach the video to a post on your blog alongside any commentary that you want to write. Similarly, to upload audio files or attach music from the popular audio sharing site SoundCloud, along with your own commentary, click audio. Tumblr's post templates work well for quick sharing, but they can be uncomfortably restrictive once you've gained experience as a blogger. For example, the 'photo' option limits you to a single photo with commentary per post. The same goes for the 'video' and 'quote' options. 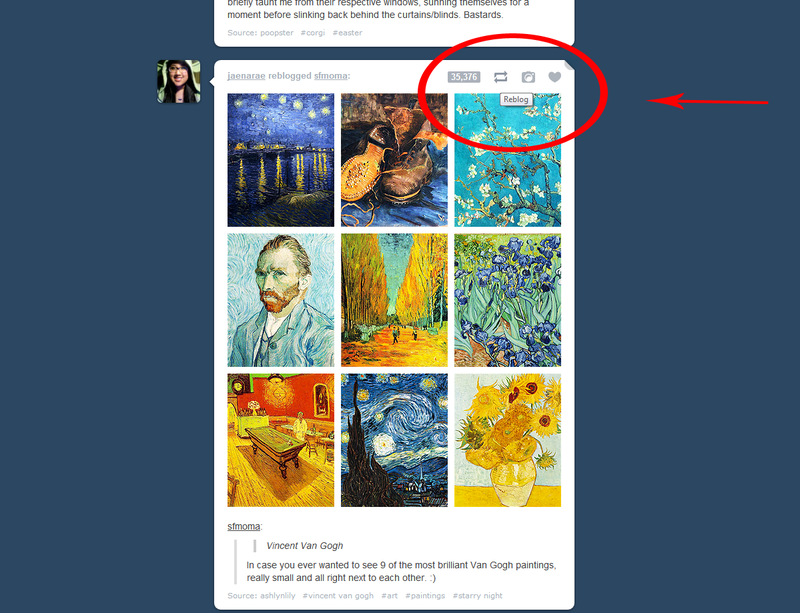 If you want to exercise a bit more control over your posts, and you're comfortable working with Tumblr, choose text. This option brings up the interface for creating a blog post with a more powerful WYSIWYG editor that enables you to insert multiple images, add HTML code for embedding YouTube videos, and even stick Tumblr's quote formatting anywhere you want in your post. To make a name for yourself on Tumblr, you need more than just great content; you also need an understanding of the Tumblr community. Tumblr has a unique system of aggregating content by following other users, as well as its own arrangement for liking posts to signal that you enjoy another user's content. Tumblr's killer feature is the ability to reblog other users easily. Just click the Reblog button at the top of the screen when viewing any other user's Tumblr post, and Tumblr will automatically import the post into your blog--with proper attribution--and allow you to add commentary to the post if you wish. Every Tumblr post features a "Reblog" button, making it easy to share content with your readers and peers in the communities. Reblogging interesting posts from other Tumblr users a smart way to add high-quality content to your blog and to build your reputation within the Tumblr community. Tumblr automatically notifies you every time another user follows you, likes one of your posts, or or reblogs it. So each time you reblog other Tumblr users' work, you promote their content and you encourage them to take a look at what you're doing; if they like what they see, they may reblog some of your posts to their followers. For bloggers who pay the goodwill forward and produce good content of their own, Tumblr is probably the easiest place on the Internet to build up a dedicated following. Learning how to communicate within the idiosyncratic Tumblr community takes a little time, but once you do, it's a wonderful place to share your insights, images, and videos. Of possible related interest: For advice on how to deal with blogspam--spam comments that attempt to link to commercial content from your blog--see "When 'Viagra' Comments on Your Blog, and Other Spam Red Flags."